There have been a few questions on the issue of peaks not being integrated, while performing quantitation, although the signal is strong. 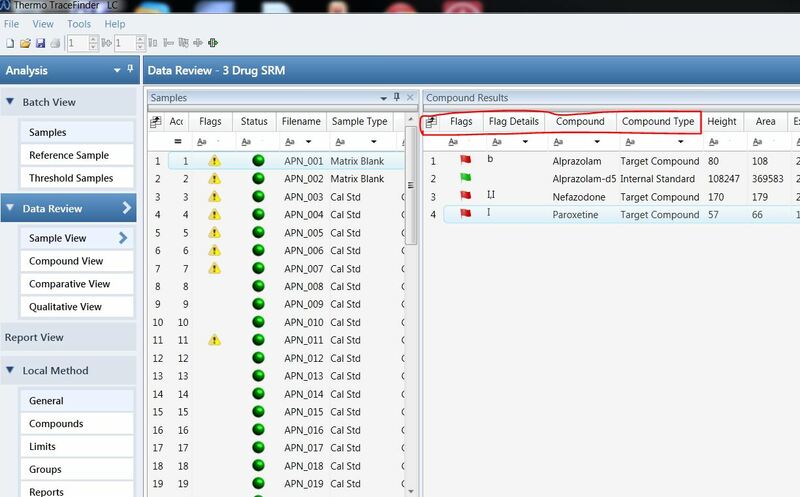 A reason could be that when a compound is created in the method, it has a related compound database entry for a threshold setting. This setting is used in targeted screening but is not editable in quantitation mode. The setting has a default value of 5000 for calculated peak area. This setting does have a global override in the Local and Master method Processing section. The default value is unchecked and blank. This means the default threshold is 5000 for all peaks. If you are having an issue where the peak is not integrated but has a strong signal, then change the setting by checking the box and entering a new value such as 0 or 500. The data will need to be reprocessed as this value is not automatically applied. 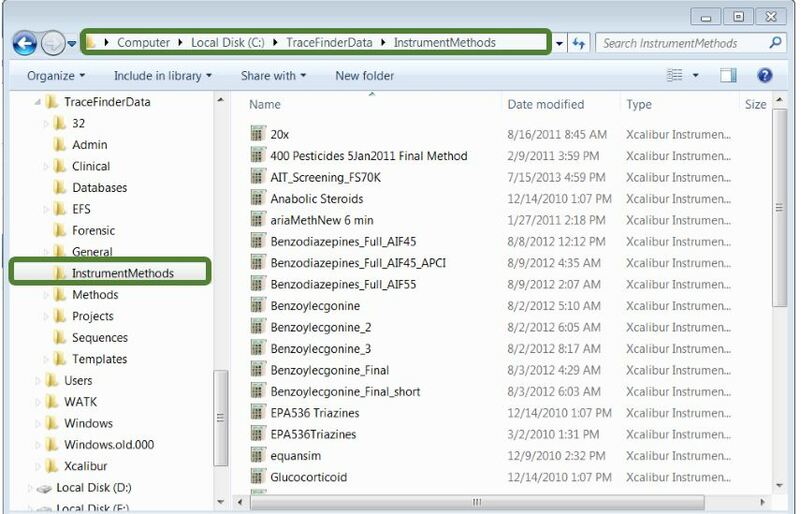 In previous versions of TraceFinder, the Instrument Method utilized for data collection was required to belong in the c:/Xcalibur/Methods directory folder. In TraceFinder 3.2, the new location for the Instrument Methods is located under the C:/TraceFinderData/Instrument Methods directory folder. Since TF has is a “managed systems”, meaning that we provide the unique capability of synced updates and other functions the Instrument Method, we have a need to know where the method is at all times. Therefore, the use of the managed directory is a requirement. By moving the Instrument Method for TraceFinder into it’s unique folder, it allows you the freedom to use any folder for method development purposes. When you have the final version for use in data collection simply save the “.meth” file into the C:\TraceFinderData\Instrument Methods directory folder, so that it will be used as a template for all the sample sets going forward. If your computer is working slowly, you might see a message saying that the theme is using most of its allowed memory. If this happens, you can change to the Windows 7 Basic theme or a high-contrast theme to improve performance. If you change the theme to Windows 7 Basic, you will no longer get the full Aero experience. Aero is the premium visual experience in this version of Windows. It features a transparent glass design, window animations, Aero Flip 3D, and live window previews. Open Personalization by clicking the Start button , and then clicking Control Panel. In the search box, type personalization, and then click Personalization. Under Basic and High Contrast Themes, click Windows 7 Basic or one of the High Contrast themes. So we’ve had a couple of people want to send data across to help them look at methods and such, but they were limited by the amount of storage on dropbox or the security concerns of an outside source. This gets you 7 Gigs of storage right off the bat. No money required. The beauty of this is that it can sync with all your MS Office applications, which you can share or keep to yourself. It also works as a location on your desktop so you don’t have to ftp large files, simply drag and drop. The really cool part about this is, if I have a iPad or other mobile device and use the SkyDrive app, I can edit my stored documents real time in the cloud. I have access to them from anywhere at anytime, and anyone I have shared the document with can collaborate in real time. For all those of you with large data sets this is a great spot to shared the files, and it works with your intergrated Windows security just as if it was a mapped drive. Excel rules the world or at least it thinks it does….. So, this week we’ve gotten a few questions on importing a sample list in CSV format. There is an error that can occur if the csv file you exported and made adjustments to, is still open in Excel when you try to reimport it.